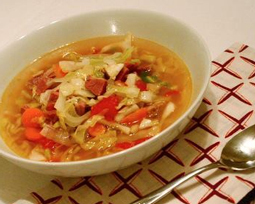 Sauerkraut and Corned Beef Soup - A recipe from Savor California, the online showcase for extraordinary gourmet foods and beverages from California. Shred the corned beef into even chunks, discarding the fat. Chop carrots and potatoes into 1/2" chunks. Combine the beef stock, potatoes, carrots and corned beef in a 2-quart pot and heat until simmering. Simmer for a half hour. Add the Fresh Raw Sauerkraut, juice and all, to the soup pot. Continue simmering for ten minutes. Adjust salt to taste. To serve, ladle into bowls and top with a tablespoon of sour cream. Sprinkle with the chopped chives and serve.